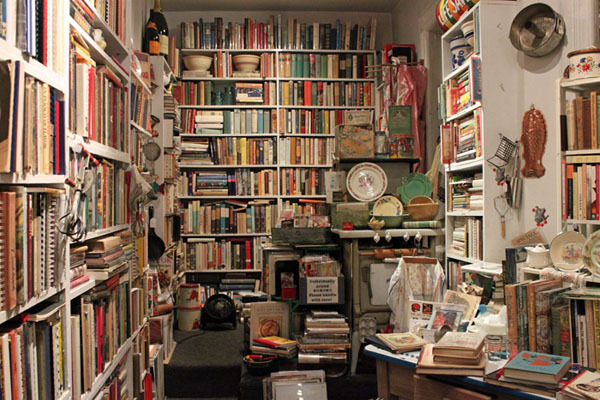 Today we chat with Bonnie Slotnick, owner of the beloved West Village shop, Bonnie Slotnick Cookbooks, which stocks thousands of out-of-print and antiquarian cookbooks. Here, she tells us about the most expensive cookbook she’s ever sold, bizarre recipes, and what Hugh Dancy bought for Claire Danes. October also marks 15 years Bonnie Slotnick Cookbooks has been in business, and to celebrate, Bonnie is offering 15% off all month on items purchased in-store. 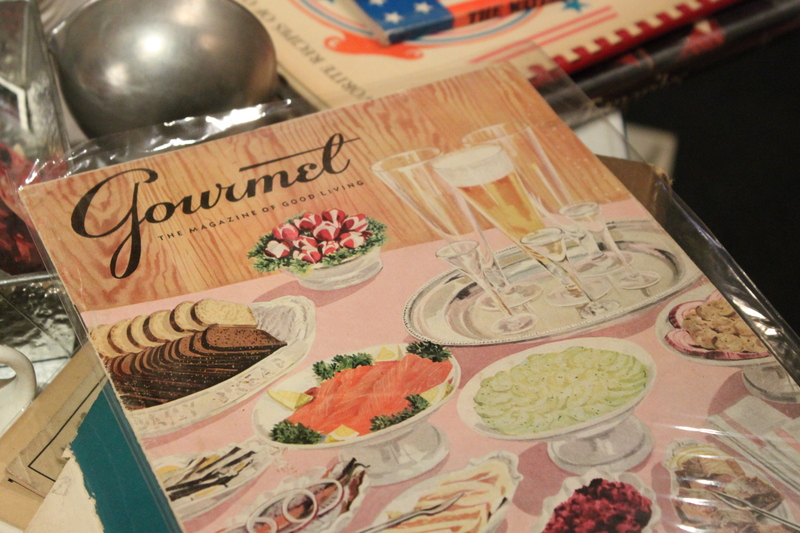 This includes her beautifully curated selection of vintage kitchen items, postcards, and linens. Cookbook Create: Where did you grow up? Did you know you wanted to be a bookseller at a young age? Bonnie: I grew up in Lakewood, New Jersey, which is enough to make some people stop reading [laughs]. It was just a sweet small town back then. I never thought I would be a bookseller but I started collecting books because of Publisher’s Clearinghouse—they would send us their catalogues of discounted books, which I took so much pleasure in perusing. Most of the books were just a dollar or two, and pretty soon I had a little collection. Originally, I wanted to be a commercial artist. I went Parsons School of Design and studied fashion illustration. I had a work-study job in the school library and ended up working there full-time for five years after graduation. My career path had already begun to veer away from art and into books! In 1984 I decided that cookbook publishing might be the perfect field for me, and I found an entry-level job with an innovative cookbook packager. Shortly afterward, I met with the owner of Kitchen Arts & Letters, a new store specializing in cookbooks, and I became their book scout, searching for out-of-print titles customers requested. I had already begun collecting cookbooks, so why not turn that into a (marginally) profitable side job? 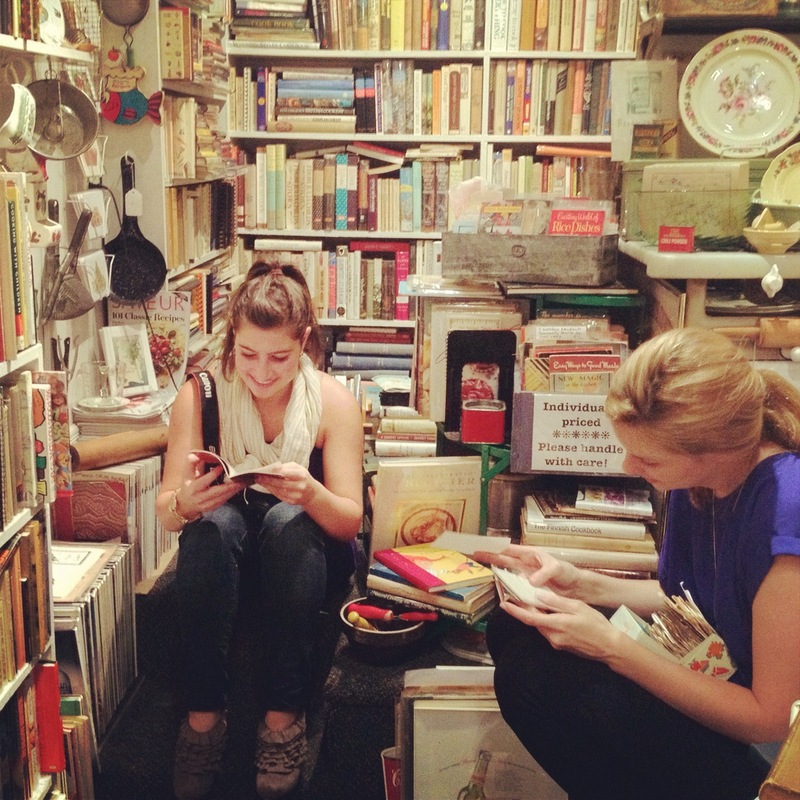 From them on, all my vacations were devoted to book buying. Over the years I accumulated a few thousand titles for store stock. After twelve years with Kitchen Arts, it was time to go out on my own. I rented a basement office and filled it with my stock of old cookbooks. Just a month later—in November 1997—Florence Fabricant highlighted the shop in her “Food Stuff” column in The New York Times. The story appeared on the day before Thanksgiving—a day when readers pay special attention to the paper’s food section. Word was out! CC: What was your family like? Bonnie: My father was a life insurance salesman, and my mother was a nursery school teacher. My sister is a professor with two Ph.D’s. She’s always been such an academic overachiever, and I wanted to do something completely different. CC: Can you tell us about a family recipe or tradition that has been passed down from generation to generation? Bonnie: One of my favorites is a poppy seed (mohn, in Yiddish) drop cookie that I have been baking since I was about seven. The recipe came from my grandmother, who died when I was very young, and I used to bake the cookies with my mother and sister. Then there’s the chocolate layer cake we always had for birthdays. My mother got the recipe from a Swan’s Down cake flour box, and she used a Sunbeam Mixmaster to make it. To this day the mere sight of a Mixmaster makes me swoon. The cake had a chocolate cream cheese frosting, which she swirled with a butter knife–mmm! I still make it every year for my birthday. CC: Is there a particular era or niche you are drawn to? Bonnie: For cookbooks, the 1850’s – 1950’s—an era before mass media really took over, when American life was still based around the home. Much of the West Village, where I’ve lived for about 40 years, was built in the nineteenth century, and it’s easy to picture what it was like back then because so much of it is blessedly unchanged. I live in a building that dates from 1892, and I can imagine a woman in long, heavy skirts climbing the three flights of marble steps to my apartment, struggling with her shopping baskets. CC: How are cookbooks selling today? Do you think sales are in any way correlated with how much people are actually cooking? Bonnie: That’s a good question. I don’t carry the practical stock of say, Barnes and Noble, and I don’t know about sales of new cookbooks. I think people are more interested in food in an in-depth way than they were 20 years ago. I sell a lot of food history books, memoirs, sociological studies of various cuisines, monographs on particular ingredients. And then there are all the people (myself included) who read cookbooks “like novels,” and who may or may not use the recipes. CC: What’s the most expensive book you’ve ever sold? Bonnie:: I just sold it yesterday! It’s “The House Servant’s Directory” by Robert Roberts, copyright 1827, and it is one of the first books by an African-American man to be published commercially in the United States. This copy came from a chef who lives here in the neighborhood. I sold it for $5,000 to a scholar and collector from Texas. The second most expensive was a first edition (1931) of ”The Joy of Cooking,” which I sold for $4,000; there were only 3,000 copies printed, so there are very few available today. CC: If you could describe you store in one word, what would it be? CC: What are your best sellers? Bonnie:: I sell a lot of American standards—Betty Crocker, Better Homes & Gardens, Good Housekeeping, and the like—to people who want the same book their mother had. Food history, biographies of chefs, and baking books are always popular. Basic cookbook and how-to books are in demand, too: Because of the economy, a lot of customers come in and say, “I just can’t afford to eat out anymore.” They want to start cooking at home and they want fairly simple recipes. CC: What is your favorite cookbook? Bonnie: The Country Kitchen, by Della Lutes, is just a perfect book in every way. It was published in 1936. The cover is red and white gingham fabric, and the recipes are woven into a charming, very personal narrative of farm life in the late nineteenth century. There are, I think, five sequels to it; they’re less about cooking, but some delicious descriptions of country meals always turn up in them. I generally dislike the contemporary cookbook culture because there is so much emphasis on celebrity chefs, hype, and contests – like, “how to get cook time down to 30 seconds or less!” These are books I don’t want or need in my store. I’m more comfortable with books that have stood the test of time. CC: Have you ever cooked a recipe from one of your antiquarian cookbooks? It wasn’t around the turn of the twentieth century, and the birth of the home economics movement, that recipes became “scientific” and precise. Then convenience products like Bisquick and Crisco came along, and the goal was to make cooking “quick and easy”: The fewer ingredients, the fewer bowls and pots and minutes spent cooking, the better. Now, after a century of that, ingredient lists and recipe instructions in cookbooks are becoming much more explicit, because basic cooking skills are no longer common knowledge. Readers may not know the meaning of terms like “fold” or “poach” or “blanch,” so the recipe has to explain them. CC: Have you had any celebrity customers? Bonnie: I’ve had a fair share of chefs, especially local ones, come in, and also some of the Food Network celebrities. Then there are people famous in other fields, most of whom I don’t recognize until I see the name on the credit card. Sean Lennon came in once with his girlfriend; they were living in the neighborhood at the time. Kieffer Sutherland shopped here a few times when he lived up the street; he was very serious about choosing the right books. The actor Hugh Dancy stopped in to buy a book for his then-fiancée, Claire Danes. She was just starting to cook so he wanted something accessible and visual. I suggested “The River Cafe Cookbook” by Rose Gray and Ruth Rodgers, which is from a very fine Italian restaurant in London. He said he had a copy himself, so he knew it would suit her. CC: Most bizarre recipe that comes to mind?